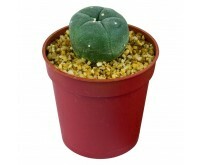 Cacti, grow kits and cactus seeds of the most famous psychoactive species: Peyote and San Pedro. Thanks to the naturally present mescaline the effect is strong and often lasts for several hours. The world-famous Peyote and San Pedro cacti contain the psychoactive substance mescaline. This natural substance promises altered states of mind and strong visual effects. Aside from the well-known Peyote cactus, we also offer seeds and grow kits so you can start growing your own mescaline cacti yourself. These special cacti contain mescaline as the most important substance. Although this psychedelic drug can be synthesized nowadays, pure mescaline does not bring the same experience as eating mescaline cacti. Cacti contain many more substances that ensure a trip feels softer and more gradual. After 30 minutes to an hour and half, you will notice the first effects. The first effects are not the most pleasant, but are necessary to start the visual journey in a clean manner. Many users experience severe nausea before the first images and hallucinations start to appear. This often leads to an emotional, dreamy inner journey with colorful visuals. Depending on the type of cacti and the dose, the trip can take four to nine hours, after which the effects of the cacti slowly decrease. The thorny desert plants of course need only little water to grow into a harvestable adult cactus. With enough sun and mineral-rich soil you have the base to see your cactus flower colorfully. Therefore go for cactus seeds from Seeds of the Gods. Growing a cactus is not difficult, but if you really lack green thumbs, you can of course buy a complete cactus grow kit. Growing your own cactus can't get easier!